Monsters Defeated by Thompson and Wedgewood · Let's Go Amerks! 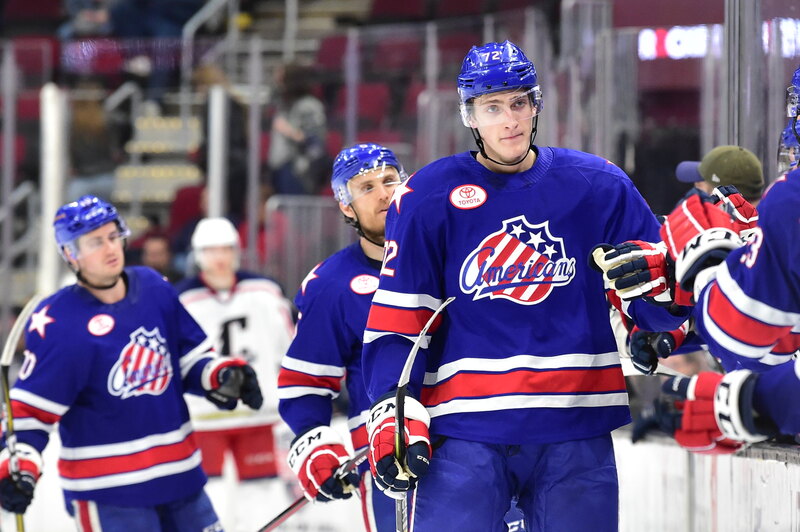 The Rochester Americans defeated the Cleveland Monsters on Monday night to guarantee at least second place in the North Division and continue their push for the first North Division title since the 2004/2005 season. Tage Thompson scored twice and Scott Wedgewood made 36 saves in the 2-1 win for the teams league leading 24th road win of the season. It wasn’t the most eventful game from start to finish but it was one in which the Amerks controlled the majority of it. A scoreless first period featured CJ Smith and Kevin Porter play a game of pass, pass, shoot but all alone in front of goalie Brad Thiessen. The shot by CJ Smith went into the arm pit of Thiessen for the save. Remi Elie also had a wide open net in the first period but a Monsters defenseman slid by for a split second blocked shot. Tage Thompson scored the first goal of the game at 2:31 of the second period with a one timer off a pass from CJ Smith. Kevin Porter started the zone entry with a pass to CJ Smith at the blue line. CJ Smith held the puck for a moment along the boards as Tage Thompson entered the zone and was setup for the on timer. About six minutes later in the game Thompson had another quality scoring chance from the same spot but Thiessen was able to get a piece of the shot that time. Thompson scored his fifth of the season at 10:34 of the third period which would also be the game winning goal. Matt Tennyson faked a shot from the point, passed the puck to Thompson, and his one timer found the back of the net again. Cleveland found the scoreboard with 2:56 remaining in the game when Taylor Leier attempted to block a centering pass but the puck ended up going past Wedgewood who was sprawling across the crease. Mark Letestu was give credit for the goal. Cleveland had a four on three advantage in the final two minutes of the game when CJ Smith was called for interference in the Monsters end. Will Borgen and Calvin Thurkauf were already in the box for coincidental roughing penalties. Rochester successfully killed off the penalty and finished the game with the 2-1 win. Defensively, Rochester played a great game at both ends of the ice. They limited the chances for Cleveland and provided Wedgewood a lot of support with the shots he had to face. Wedgewood remains second overall in the American League with 28 wins. Thompson now has 7 points (5G+2A) in five games played with the Amerks. He also leads the team with 20 shots over the last five games. The win guaranteed Rochester at least second place in the North Division. There’s three games remaining and there’s still a chance for the North Division title. Syracuse is a point ahead of Rochester in the standings. The two teams play Saturday night in Syracuse. Victor Olofsson, Lawrence Pilut, and Alex Nylander were assigned to Rochester from Buffalo on Monday afternoon. They did not play or travel to Cleveland. Danny O’Regan sat out the game again with a day to day injury. Rochester has Tuesday off before returning to practice Wednesday to prepare for the final three games of the regular season. First round home playoff dates and times were announced. Details in the link below.